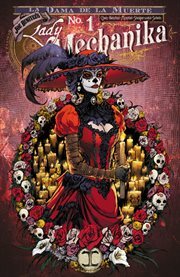 The item Lady mechanika: la dama de la muerte, Issue 1, Joe Benitez and M. M. Chen, (ebook) represents a specific, individual, material embodiment of a distinct intellectual or artistic creation found in Charlotte Mecklenburg Library. After suffering a tragic loss, Lady Mechanika takes a trip to a small Mexican village just in time for their Da̕ de los Muertos celebration. But the festivities turn truly deadly after the arrival of the Jinetes del Infierno, the mythical Hell Riders!